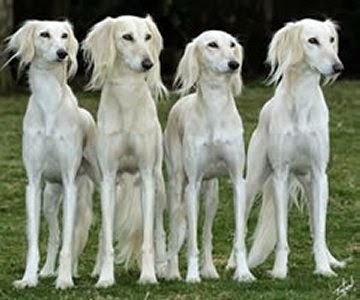 Saluki or Royal Dog of Egypt or Persian Greyhound is one of the oldest known breeds of domesticated dog in existence. They were considered to be the “ Royal Dog of Egypt “ . Salukis are “ sight” hounds, which means they hunt by sight, run the quarry down, catch it, and kill or retrieve it. The normal range for the breed is 23-28 inches high at the wither and 18-27 kg in weight, with female being slightly smaller than female. The Saluki’s is long and narrow with large eyes and drop ears. The tail of the breed is long and curved. 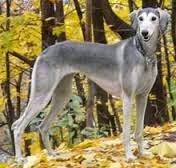 It has the typical deep-chested, long legged body of the sight hounds. Their coats in a variety of colours, including white, cream, fawn, red, girzze and tan, black and tan and tri-colour (white, black and tan). 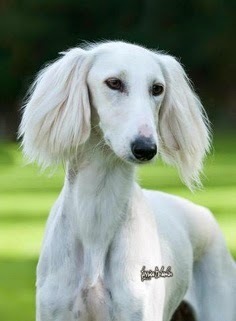 The overall appearance of the Saluki is one of grace and symmetry. 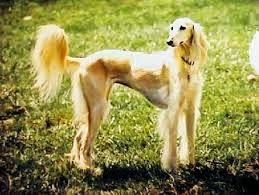 There are two coat types evident in the Saluki gene pool, smooth and feathered. The feathered variety has light feathering on the back of the legs and thighs. The feathered type has long hair on its tail, ears between the toes and occasionally behind its legs. The smooth variety, meanwhile, does not possess any long feathering, its coat is short and silky. The fur on both varieties is silky to the touch and is low shedding compared to other breeds. One of the swiftest and most graceful of all breeds, the aristocratic Saluki is possessed of a quiet dignity and independence. Saluki are aloof with strangers and require early socialization to encourage an outgoing attitude. The breed was originally used by the Arabs to track and bring down gazelle, the fastest of the antelopes. Salukis are highly intelligent. However, they also extremely sensitive. Salukis are exotic, beautiful, athletic and spirited. They are clean, don’t shed much and drqw logs of attention from passers by. 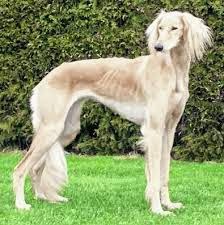 The Saluki is a graceful dog, with great speed, endurance and strength, all of which enable it to hunt and kill gazelle or other quarry over deep sand or rocky mountains. 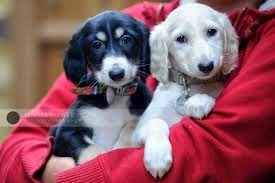 The Saluki has an average lifespan of 12 to 14 years. 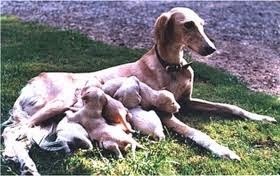 The Saluki remained pure for hundred of years because it was not allowed to breed with non-Saluki. 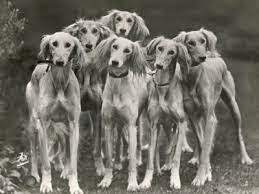 The Saluki was introduced to the West, evnually recognized by the American Kennel Club in 1927. 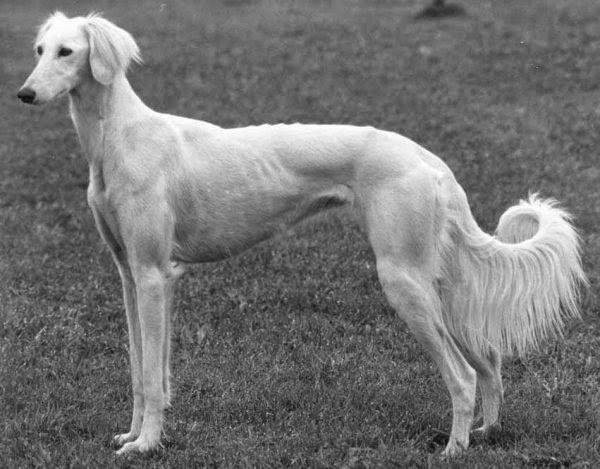 Today the main function of the exotic Saluki is as a show dog and companion, but many are also used for hare hunting. The Saluki see, to enjoy dog sports such as lure coursing, racing, agility, tracking, flyball, exhibition jumping, rally and competitive obedience.